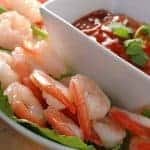 Conventional shrimp cocktail makes an easy appetizer for a dinner party – just mix up your cocktail sauce, arrange the shrimp and you’re good to go, but the old standby cocktail sauce doesn’t necessarily complement every meal. 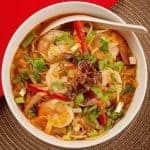 This is a Thai-inspired variation that has made a big hit each time I’ve served it, and it makes a nice prelude to any Asian-style entree. An Asian-style twist on conventional shrimp cocktail with fresh lime and cilantro is a refreshing change. 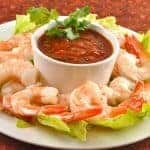 Combine the ketchup, horseradish, Thai chili sauce, lime juice, fish sauce, sambal and chopped cilantro in a bowl. Transfer to a serving bowl and chill for at least 20 minutes. 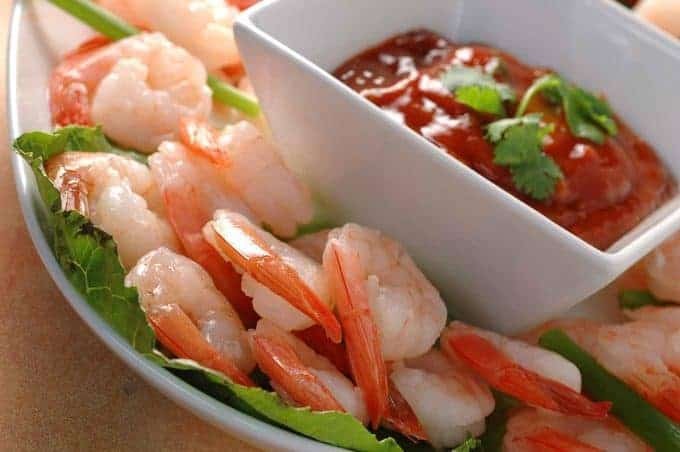 Squeeze fresh lime juice over the shrimp, arrange them on a platter around the cocktail sauce and serve immediately. Love the really sharp sauce here!